Welcome to the final episode of Followup Fall for 2016. In this episode, we return to Sweet Tooth by Jeff Lemire. We talk about the world, the prophecy, the characters and more. This is a truly interesting episode where Dylan and John have very different ideas about the story. Our next podcast will be Bat Books For Beginners 147 – Birds of Prey: Catwoman/Oracle on Tuesday, October 18th. Our next Arc Reactions episode will be Dr. Strange (film) on November 6th. 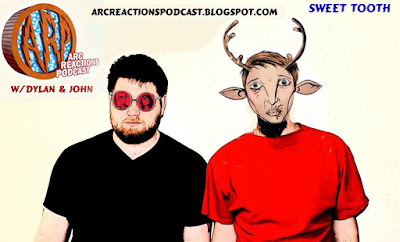 This entry was posted in Arc Reactions Podcast and tagged Arc Reactions, Comics, followup fall, Jeff Lemire, podcast, post apocalyptic story, prophecy, sweet tooth, world building by John. Bookmark the permalink.